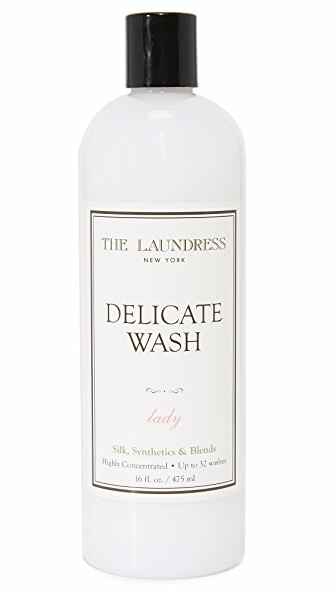 This The Laundress laundry detergent is specially crafted for delicates. From silk blouses to thin scarves, the special formula removes perspiration, body oils, and stains while cleaning and preserving fabrics. The scent is a blend of herbal, citrus, rich amber, bergamot, lavender, and musk. 16 fl. oz. / 475 ml. Made in the USA. Ingredients: plant-derived anionic and nonionic surfactants, stain-fighting and cleaning enzymes (protease, amylase, lipase), mineral-derived cleaning enhancers (sodium gluconate and calcium chloride), essential oils, and fragrance.